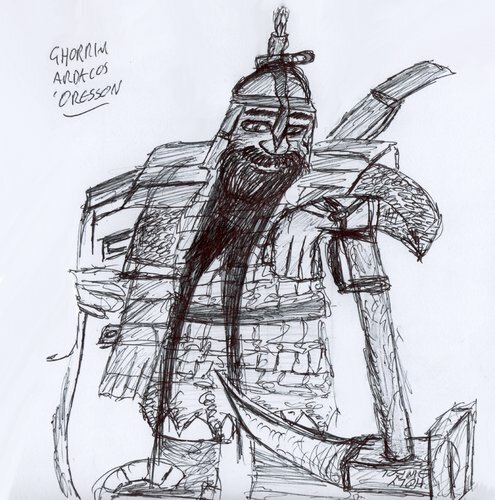 Aliases: Ghor, Ardie, that gorram dwarf. Granted Power: You cast good spells at +1 caster level. 1. Protection from Evil: +2 to AC and saves, counter mind control, hedge out elementals and outsiders. 2. Aid: +1 on attack rolls, +1 on saves against fear, 1d8 temporary hp +1/level (max +10). 3. Magic Circle against Evil: As protection spells, but 10' radius and 10 min./level. 4. Holy Smite: Damages and blinds evil creatures. 5. Dispel Evil: +4 bonus against attacks by evil creatures. 6. Blade Barrier: Wall of blades deals 1d6/level damage. 7. Holy Word: Kills, paralyzes, slows, or deafens nongood subjects. 8. Holy AuraF: +4 to AC, +4 resistance, and SR 25 against evil spells. 9. Summon Monster IX: Calls extraplanar creature to fight for you (Good only). 1. Magic Weapon: Weapon gains +1 bonus. 2. Heat Metal: Make metal so hot it damages those who touch it. 3. Keen Edge: Doubles normal weapon's threat range. 4. Rusting Grasp: Your touch corrodes iron and alloys. 5. Wall of IronM: 30 hp/4 levels; can topple onto foes. 7. Transmute Metal to Wood: Metal within 40' becomes wood. 8. Iron Body: Your body becomes living iron. 9. Repel Metal or Stone: Pushes away metal and stone. * +2 Constitution, +2 Wisdom, –2 Charisma: Dwarves are both tough and wise, but also a bit gruff. * Medium: Dwarves are Medium creatures and have no bonuses or penalties due to their size. * Slow and Steady: Dwarves have a base speed of 20 feet, but their speed is never modified by armor or encumbrance. * Darkvision: Dwarves can see in the dark up to 60 feet. * Defensive Training: Dwarves get a +4 dodge bonus to AC against monsters of the giant type. * Easy Appraisals: Dwarves receive a +2 racial bonus on Appraise skill checks made to determine the price of nonmagical goods that contain precious metals or gemstones. * Hatred: Dwarves receive a +1 bonus on attack rolls against humanoid creatures of the orc and goblinoid subtypes due to special training against these hated foes. * Hardy: Dwarves receive a +2 racial bonus on saving throws against poison, spells, and spell-like abilities. * Stability: Dwarves receive a +4 racial bonus when resisting a bull rush or trip attempt while standing on the ground. * Stonecunning: Dwarves receive a +2 bonus on Perception checks to potentially notice unusual stonework, such as traps and hidden doors located in stone walls or floors. They receive a check to notice such features whenever they pass within 10 feet of them, whether or not they are actively looking. * Weapon Familiarity: Dwarves are proficient with battleaxes, heavy picks, and warhammers, and treat any weapon with the word “dwarven” in its name as a martial weapon. * Languages: Dwarves begin play speaking Common and Giant. Dwarves with high Intelligence scores can choose from the following: Sylvan, Goblin, Wildlander, Terran, and Undercommon.